Is the new MacBook Air really the future of notebooks as Steve Jobs claims? ,The 1.86 GHz 13-inch MacBook Air with 2GB of memory and 128GB of flash storage starts at a suggested retail price of £1,099.00 inc VAT (£935.32 ex VAT) with a 256GB model for £1,349.00 inc VAT (£1,148.09 ex VAT). Jobs is certainly dead-on when he suggests that the future of notebooks is in ever-slimmer, lighter laptops featuring flash storage. But is the new MacBook Air like nothing Apple has created before? Not really. The 13.3-inch model is basically an improved version of the previous MacBook Air, albeit at a better price. The new 11.6-inch MacBook Air, on the other hand, is the smallest and lightest Apple laptop of all time, and its base price of $999 ties it with the plastic MacBook as the cheapest Mac laptop available. I’m not sure I’d call it unlike anything Apple’s created before—it’s got all the stylings of the MacBook Air and MacBook Pro lines, but is tiny like the legendary 12-inch PowerBook of old—but it might be the most novel new Mac released since the Intel Mac era began. The display piece of the laptop is extremely thin, but the aluminum shell means it’s fairly rigid. Certainly it doesn’t feel fragile or flimsy. And a new hinge design means you can now open the display at a wider angle than previous Airs. The bottom half makes up the bulk of the laptop, and this is where Apple definitely made some changes compared to earlier MacBook Airs. The older Airs had curved edges all around, a choice that forced the design of a drop-down door to expose the laptop’s headphone, display, and USB ports. These new Airs have flat sides and a slightly curved bottom. The result is that when you pick one up, it feels a bit chunkier than the older models, even though it’s really not. By trading off that illusion of extra thinness, Apple gets to ditch the drop-down door and station ports right on the sides of the laptops. On the left side, there’s a MagSafe connector, USB 2.0 port, headphone jack, and a built-in microphone. 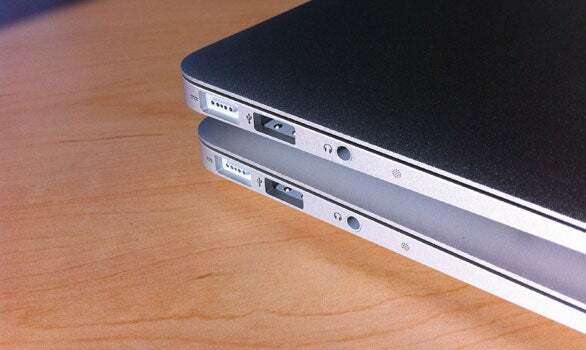 On the right, there’s a Mini DisplayPort, another USB 2.0 port, and (on the 13-inch model only) an SD card slot. These small laptops can drive large displays via that Mini DisplayPort, at resolutions up to 2560 by 1600—meaning they’ll even drive Apple’s 27-inch LED Cinema Display. (The Apple display’s included MagSafe and Mini DisplayPort cables will stretch to reach those ports, which are situated on opposite sides of the MacBook Air—but just barely.) Both models are driven by a nVidia GeForce 320M graphics processor (the same one used in the 13-inch MacBook Pro), and it’s a nice step up from the nVidia GeForce 9400 used in previous Airs; the new models showed off much improved graphics performance compared to their predecessors.